Connie Bergstein Dow has forty years of experience performing and teaching dance to young children and adults in the United States and Latin America. She holds an MFA in dance from the University of Michigan. 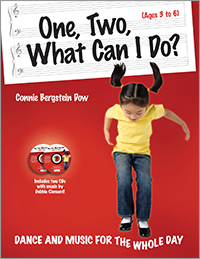 Connie is the author of Dance, Turn, Hop, Learn! 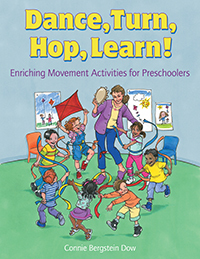 Enriching Movement Activities for Preschoolers and several articles about dance. Keep the day moving with 109 playful dance activities, each providing children with opportunities to exercise, practice and improve age-appropriate large motor skills, and develop body awareness and control. Enhance children's physical, social and emotional, and kinesthetic learning with movement activities while creating structure throughout your day, including greetings and goodbyes, group time, transitions, and quiet time. Accessible and adaptable for all children, including those with special needs or different learning styles, each dance-and-music pairing is irresistibly fun. An accompanying music CD is included with 42 tracks written and performed by Debbie Clement. You may want to introduce the children in your care to dance and movement. But without training in dance, you may feel unsure of your skills.